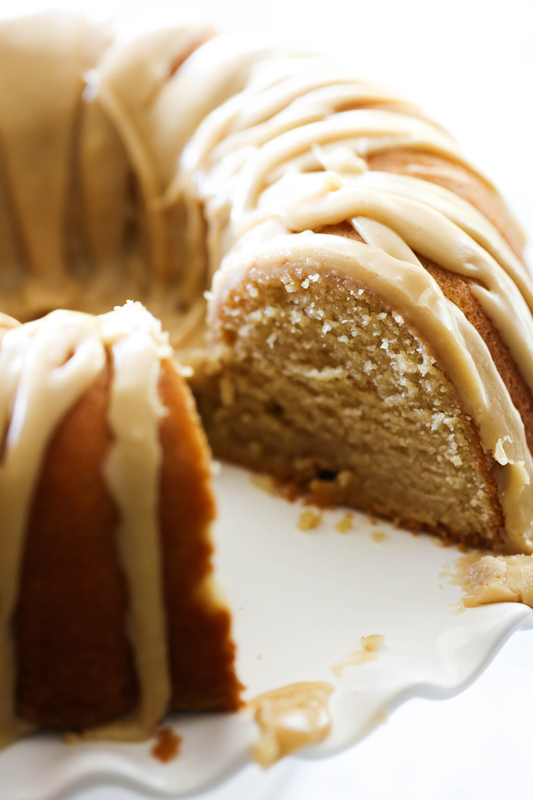 This Caramel Bundt Cake is so moist and delicious. 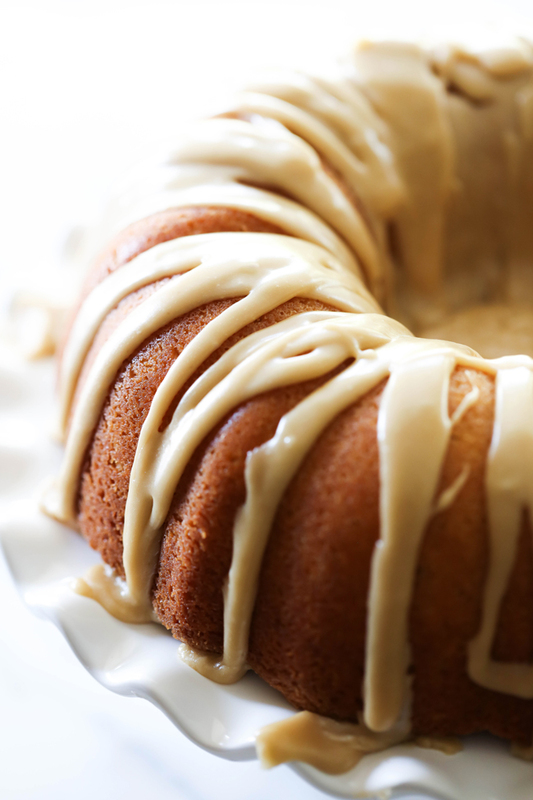 It has such a tasty rich caramel flavor and topped with an incredible caramel icing. It is so hard to stop at just one slice! While I’ve been waiting for baby girl to make her debut, I have been enjoying some pretty great desserts. Every now and then I make a dessert that I can’t get enough of. 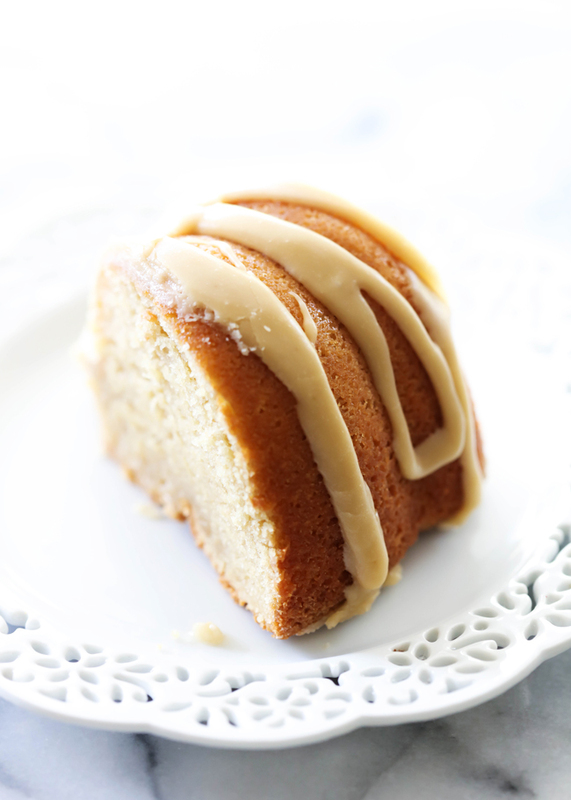 This Caramel Bundt Cake is one of my new favorite cakes on the blog! It is out of this world! If you love caramel, this is a must try! Trust me. It is one of my new favorite desserts! It is so moist and is packed with an irresistible flavor. It is the perfect cake anytime of year and is a total crowd pleaser! Spray bundt pan with baking spray that has flour in it. In a large mixing bowl, cream butter and sugars for 4 minutes. Add oil, eggs, and vanilla beating again for 5 minutes. Combine flour, baking powder and salt. Add flour alternately with milk until it is all incorporated. Pour batter in prepared bundt pan and bake for about an hour and 15 minutes. Cake is done when toothpick comes out clean. Invert cake onto cooling rack. Cool completely and then drizzle frosting. Remove immediately from heat and add in 1 cup powdered sugar. Add in more milk if needed to thin frosting or more powdered sugar to get it thicker. I know you are pregnant ;) but there are several typos in the recipe. The flour is listed twice and vegetable has the l and the b reversed. I totally get it, pregnancy brain is real, I just thought you would want to know. I see to add the flour alternately with the milk but do not see how much milk. I am so excited to try this recipe. I am SO sorry! It is 1 cup milk. It is fixed to add it now. Thanks for catching that! I don't see milk in the cake recipe ingredients, but it mentions adding it to flour towards the end.????? Recipe calls for milk but none is listed????? The directions say to combine alternately with flour mixture and milk. Milk? I am SO sorry! It is 1 cup milk. It is fixed to add it now. Thanks for catching that! and thanks so much for your congratulations! We are so excited! Can you use butter in this recipe instead of vegetable oil?